Primary Natural Resources petroleum, copper, natural gas, pyrites, nickel. NORWAY IS A LONG, narrow country, stretching from the North Sea to the ARCTIC OCEAN, roughly the same length as the eastern coast of the UNITED STATES. Most of its terrain is rocky and mountainous, leaving little room for settlement or agriculture. Norwegians have thus traditionally turned to the sea for their livelihood; and although fishing remains a crucial industry, along with shipping—Norway’s fleet is the fourth largest in the world—since the 1970s, it has been oil and natural gas pumped from the sea that has transformed the economy into one of the most dynamic in all of Europe. And because Norway generates nearly all of its electricity from hydroelectric stations on its swift mountain rivers, most of its oil is exported, making Norway the second largest oil exporter and providing a generous trade surplus that has been translated into one of the most comprehensive social welfare systems and the highest standard of living in the world. Measuring Norway’s coast can yield varying results: the direct distance from point to point is about 1,100 mi (1,770 km), while measurements that include all of the thousands of fjords and inlets bring the number closer to 15,592 mi (25,148 km). Including the 50,000 or so islands off Norway’s coast, the distance rises again to 36,042 mi (58,133 km), giving Norway the longest coastline in the world. Norway occupies the western part of the Scandinavian Peninsula, shared with SWEDEN. The mountainous backbone of the peninsula, the Kjølen, forms the 972-mi (1,619-km) border with Sweden, except in the south, where Norway’s territory includes the relatively flat basin east of the mountains, the location of the city of Oslo and the country’s principal river, the Glåma. 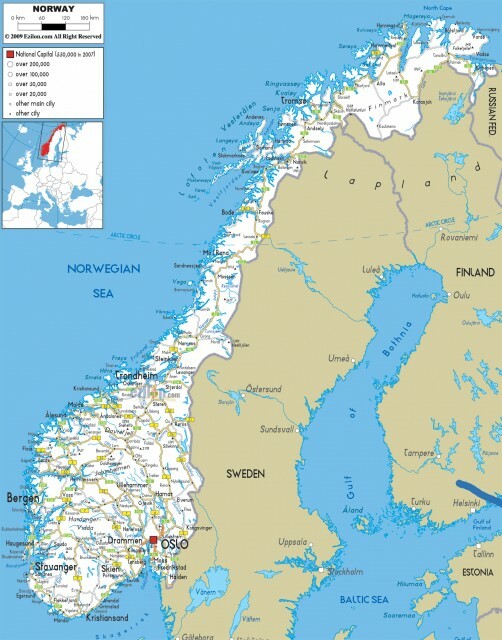 Norway also shares a border in the far north with FINLAND, and a small stretch of border with RUSSIA (122 mi or 196 km), along the coast of the Barents Sea. The kingdom also includes several dependencies: BOUVET ISLAND in the South Atlantic, Peter I Island in the South Pacific (both close to ANTARCTICA), Jan Mayen in the North Atlantic, and Svalbard, an archipelago north of the mainland, bordering on the Arctic Ocean. Norway’s geologic features are very old, dominated by the ancient Fennoscandian (or Baltic) Shield, and the mountainous chain that rises above it—a range that matches in age and structure the highlands of northwest Scotland and the Appalachian mountains in the eastern United States. The rocky surfaces of these land masses are worn down and marked by several waves of glaciation; most of Norway’s coastal regions are bare or thinly covered rock. Glaciation is also responsible for Norway’s most characteristic feature, its long, narrow fjords, bordered by rugged peaks. Nearly 2,000 glaciers are left over from the last period of ice cover. The climate is cold, but moderated by warmer air from the Gulf Stream. In the far north, arctic conditions are more common. This area is home to Norway’s Lapp, or Sami, population, many of whom continue to lead a traditional lifestyle of reindeer herding, though today this is largely done by snowmobile rather than on foot. In these areas, land of the midnight sun, the sun never drops below the horizon from May to July. Norway has been fully independent only since 1905. Several centuries before, a Viking maritime empire had dominated the North Sea and North Atlantic, with settlements in ICELAND, GREENLAND, parts of Scotland and IRELAND, and even as far south as northwest FRANCE, an area of which they gave their name, Normandy. From the late 14th century, however, Norway lost its independence to Denmark and remained a satellite kingdom for four centuries before being transferred to the jurisdiction of Sweden during the 19th century. Norway was one of the first nations to join the NORTH ATLANTIC TREATY ORGANIZATION (NATO) after World War II but was less willing to join the common market, rejecting EUROPEAN UNION (EU) membership in referenda in 1972 and 1994. Besides the petroleum and gas industries, Norway’s economy is dominated by food processing, shipbuilding, pulp and paper products, machinery, chemicals, and the centuries-old mainstay, fishing.